Saints come in many sizes and varieties, ranging from kings to beggars, surgeons to street sweepers, scholars to the illiterate, the extraordinary to the unnoticed. Some never marry, some are the parents of large families. Some die in bed in their old age, others die early in life at the hands of executioners. There are millions of saints — heaven is crowded — but relatively few of heaven’s population have been formally canonized. The vast majority are rank-and-file saints, an inspiration to those who knew them, but never placed by name on the church calendar. Reporting on canonizations, journalists often say that so-and-so was “made a saint” today at such-and-such location, but in fact the Church does not make saints. Canonization is merely an act of carefully considered recognition that a particular person became a saint in his lifetime and is unquestionably among the blessed and thus in no need of our prayers for his forgiveness and salvation. The saints who are singled out for special recognition are mentioned at the Liturgy on a particular day every year, some locally or nationally, others in churches around the world. They are also depicted in icons in both churches and homes. The majority of those canonized are martyrs. One of these — Alexander Schmorell — was added to the church calendar this past weekend. His canonization took place at the Cathedral of the New Martyrs and Confessors of Russia, a church in Munich not far from Schmorell’s grave. On the far side of the cemetery, at Stadelheim Prison, Schmorell was beheaded on 13 July 1943. He was only 25 at the time. He was an Orthodox Christian who had put his life at risk by being part of a anti-Nazi resistance group. The canonization got underway on Saturday afternoon, February 3, as people began to gather in the church. Aware that the reporters and cameramen present would need certain photos before the ceremonies started, Fr. Nikolai Artemoff, dean of the cathedral, brought out the icon of Alexander Schmorell in anticipation of its formal presentation later in the day. Many photos were taken, a pre-canonization ceremony that would not have been imagined in earlier centuries. The icon showed Alexander Schmorell as the tall, brown-haired young man he was, wearing the white robe of a physician with a Red Cross arm band (he had been a medical student at Munich’s Maximilian University), his left hand raised in a gesture of greeting, the other holding a blood-red cross plus a white rose. He is standing against a pure gold background representing eternity and the kingdom of God. Press photos taken and interviews completed, at about 4 PM a procession of about two hundred people set out led by a cross bearer. 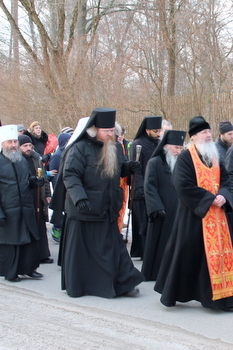 Behind the cross were six bishops: Archbishop Mark (who leads the Russian Orthodox Church Outside Russia in Germany), Metropolitan Valentin of Orenburg (the Russian city where Schmorell was born), Metropolitan Onufriy of Czernowitz in Ukraine, Archbishop Feofan of Berlin, Bishop Michael of Geneva, and Bishop Agapit of Stuttgart. How many priests? I lost count. The frigid air was challenging — it was about 15 degrees below zero Centigrade (5 degrees Fahrenheit), with snow and ice on the ground. Though the cemetery, Perlacher Forst, was just across the street, its entrance was several hundred meters away. Once inside the gate, we wound our way through tombstone-lined paths, first stopping to pray at the graves of Hans and Sophie School, the brother and sister who were the first to be executed from the White Rose group, and Christoph Probst, beheaded the same day — 22 February 1943. Here three tall black crosses stand side by side, a single cross piece linking the crosses over the Scholl graves. Sophie, the one woman in the White Rose inner circle, and the youngest, was 21 when she was killed. Today many German streets and squares are named in honor of Sophie and Hans Scholl, Alexander Schmorell, Christoph Probst and others executed for their part in the White Rose. Hans and Sophie came from a closely-knit Lutheran family. Christoph Probst was baptized in the Catholic Church a day before his execution. The procession than continued to Alexander Schmorell’s resting place, not far away. A bouquet of white roses was resting against the rough surface of the tombstone and more flowers heaped over the grave. Embedded in the stone was a bronze Russian Orthodox crucifix. Memorial prayers — a panikhida — was sung, concluding with the melodic two-word chant, Vyechnaya Pamyat (eternal memory), sung repeatedly by all present. Every year there has been a panikhida sung at this grave on the 13th of July, the anniversary of Schmorell’s death, but this was the final panikhida. Now that he has been officially glorified, future services at his grave no longer have a penitential character. The high point of the day came during the Saturday evening Vigil, which began at 5 PM and lasted three-and-a-half hours, by which time an almost full moon was shining through the windows. In the middle of the service, several icon stands were placed in the center of the church with candle stands behind. At least a hundred candles were lit, forming a curtain of light. Finally a procession of bishops, clergy and altar servers poured out of the sanctuary carrying an icon of Saint Alexander Schmorell followed by another icon crowded with images of New Martyrs of the twentieth century. Next came a huge silver-bound Gospel book, a copy that had been a gift from Russia’s last czar, Nicholas II, to Russian Orthodox Christians in Germany. The two icons and the Gospel book were solemnly placed side by side on the stands, then incensed. 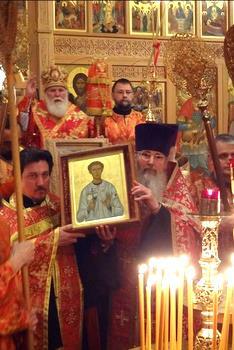 Finally everyone in the church, beginning with the six bishops, venerated the icon of the newly recognized saint. In the Orthodox Church every Sunday is regarded as a little Easter, but rarely have I experienced so intense a paschal radiance. Resurrection was at the heart of Father Nikolai’s sermon, delivered just before communion. He reminded us that the name the White Rose group adopted for itself had been proposed by Alexander Schmorell. His suggestion came from a story in the novel The Brothers Karamazov, written by Schmorell’s most beloved author, Dostoevsky. In one chapter Christ comes back to earth, “softly, unobserved, and yet, strange to say, every one recognized Him.” He is suddenly present among the many people in Seville’s cathedral square, a place were the pavement is still warm from the burning of a hundred heretics. Responding to a mother’s desperate appeal, Christ raises from the dead a young girl whose open coffin was being carried across the square on its way to the cemetery. Flowers have been laid on her body. “The procession halts, the coffin is laid on the steps at [Christ’s] feet. He looks with compassion, and His lips softly pronounce the words, ‘Maiden, arise!’ and she arises. The little girl sits up in the coffin and looks round, smiling with wide-open wondering eyes, holding a bunch of white roses they had put in her hand.” This merciful action completed, he is recognized by the Grand Inquisitor, who orders Christ’s arrest. The white rose is a paschal symbol, a sign of the victory of life over death. Today a light adorns our glorious city, / having within it your holy relics, O Holy Martyr Alexander; / for which sake pray to Christ God / that He deliver us from all tribulations, / for gathered together in love we celebrate your radiant memory / imitating your bravery, / standing against the godless powers and enemies. From your mother you did inherit the love of Christ, / and through the love of your care-giver you were nourished in the fear of God, O all-glorious one, / to Whom you did give thyself, O all-honorable Alexander, / and you diligently pray with the angels. / Entreat on behalf of all who honor your memory a forgiveness of their sins.